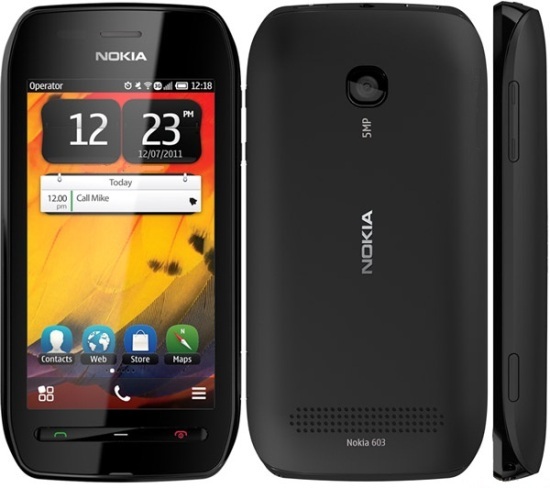 LetsBuy has just made the Nokia 603 available for online purchase. The Nokia Belle running handset was announced back in October is being offered in the black colour option and boasts a 1GHz processor. The handset will be powered by a 1GHz processor with 512MB RAM, and will include a 3.5-inch ClearBlack display with nHD resolution (640 x 360 pixels), measure at 113.5 x 57.1 x 12.7mm, USB with OTG support, Bluetooth 3.0, Wi-Fi, HSDPA 3G, NFC, a 5 megapixel camera with digital zoom and 720p video capabilities at 30fps and a 1300mAh. The handset also comes with interchangeable back covers to suit your moods. The 603 does remind us and seems similar to the Lumia 710. Interested? Go check out the LetsBuy page over here.